The maquettes feature protruding armatures, treated as an exoskeleton, or scaffold, for bodies to exist within. 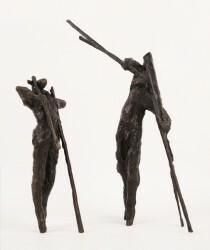 Two from a series of seven bronzes, made on consecutive days, featuring a diminutive figure breaking sticks over his shoulders in a sequence from a near-straight stick, to one completely broken round the neck. Born, raised and still residing in Suffolk, artist Laurence Edwards began his training at Canterbury College of Art and in 1988 he moved to London to study bronze casting and sculpture at the Royal College of Art. There he won a clutch of prizes, one of which enabled him to travel to India where he was able to study traditional casting techniques. Combining the resulting knowledge with state of the art casting techniques, he has produced an army of monumental figures that that feel simultaneously mythological and modern. Laurence Edwards has completed a number of public commissions across the country, sits on a number of gallery committees, runs his own gallery space and is a guest curator at Wingfield Arts. His familiarity with the processes of bronze has led him away from conventional casting – he has chosen another path, one that relishes experimentation and technical innovation. In 2006 Edwards won the Freakley Prize for the most outstanding portrait sculpture awarded by the Society of Portrait Sculptors.